Thrill your clients, friends and guests with a gift of our custom chocolate coins (1.5”) packaged in beautiful clear boxes. 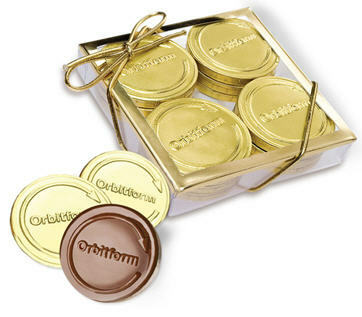 Every box contains 12 pieces of the mouth-watering, award-winning chocolate coins. Gold trim and stretch bow adds to the elegance of the package! You also get the benefit of No Setup Fee!